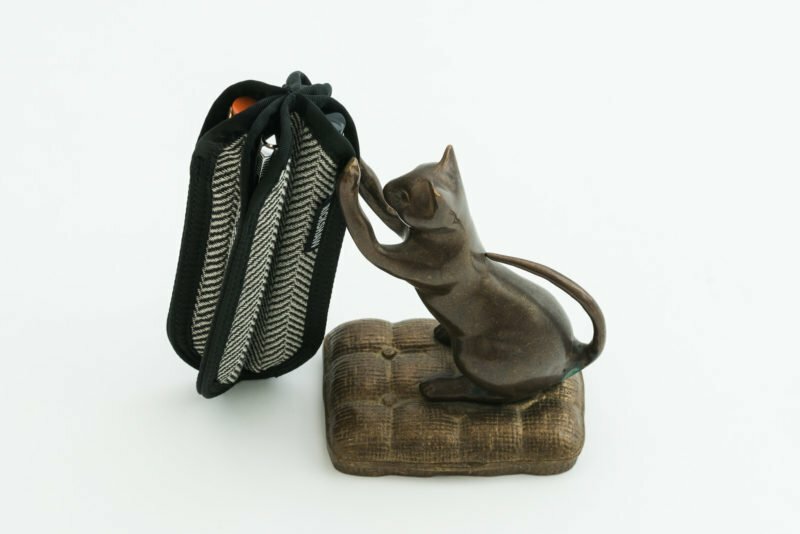 If you’ve ever wondered how you could protect your fountain pens while you’re out and about, you’re not alone. At home they’re usually not exposed to very much danger when they’re sitting on a table, but once you leave the house they’ll usually end up in a backpack, pocket or purse. 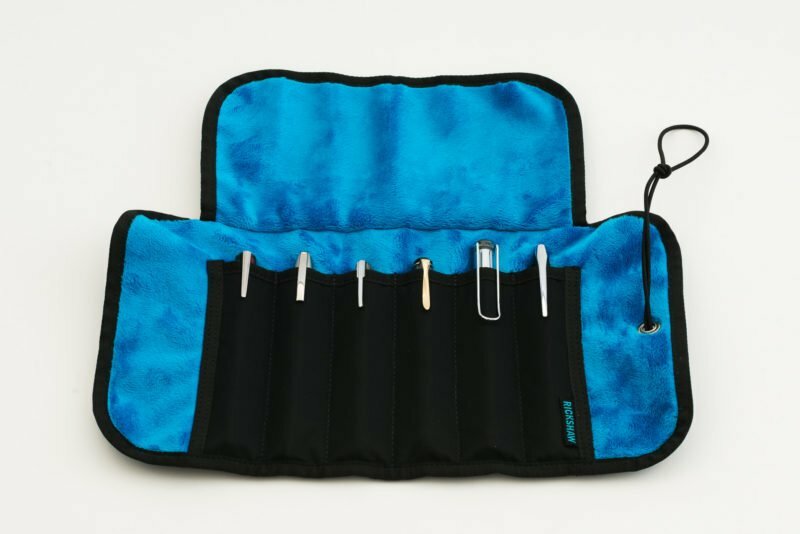 One of the easiest and most compact ways you can protect your pens is with a pen sleeve. 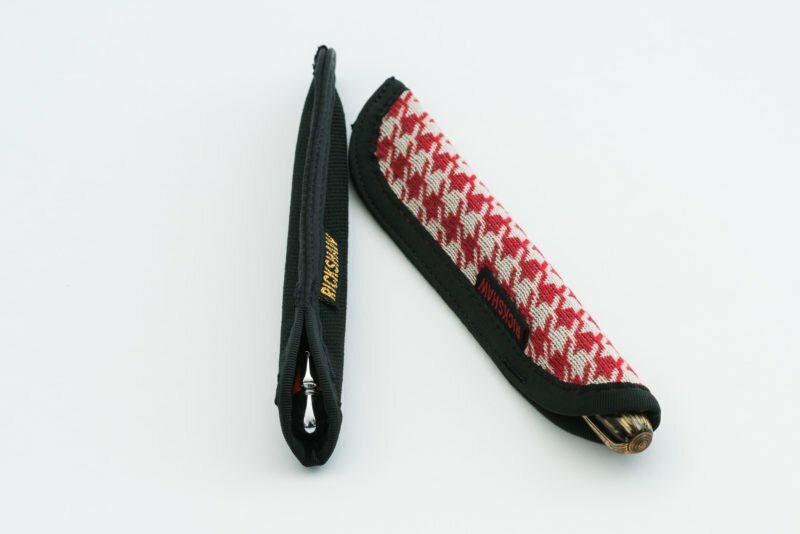 In this post, I’ll be reviewing a variety of Rickshaw pen sleeves, cases and rolls so you can decide which might work the best for you. Disclaimer: All of the products in this review were given to me by Rickshaw Bags for review, but that in no way influenced my opinion. I plan to hold some giveaways with them in the near future. I first came across Rickshaw Bags on Instagram. I started following them and realized they’re based in San Francisco, which is where I live. 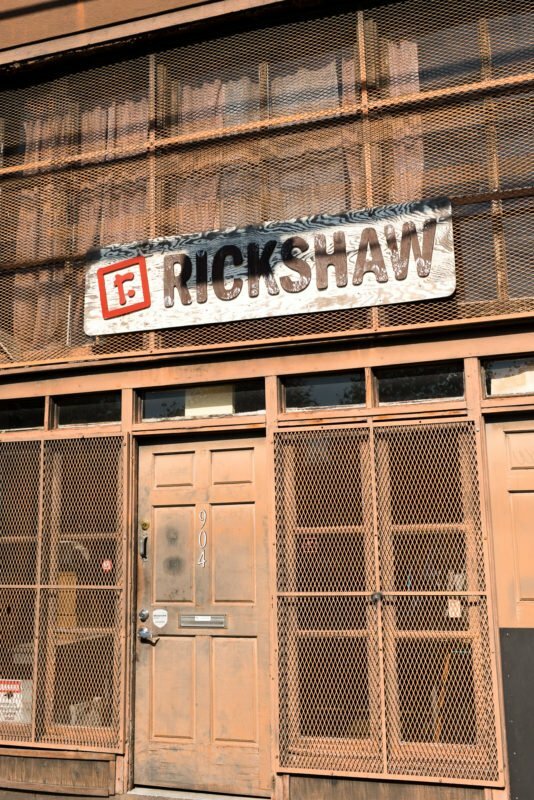 Imagine my surprise when I received an email from Mark, the founder and CEO of Rickshaw, asking if I’d like to come visit their factory store and pick up a few samples to review. Of course, I jumped at the opportunity. Not only do I like to support local businesses, but I also love to see how things are made! I was greeted by Mark, who gave me a tour of the factory. Mark isn’t just a bag guy… he’s also a fountain pen guy! 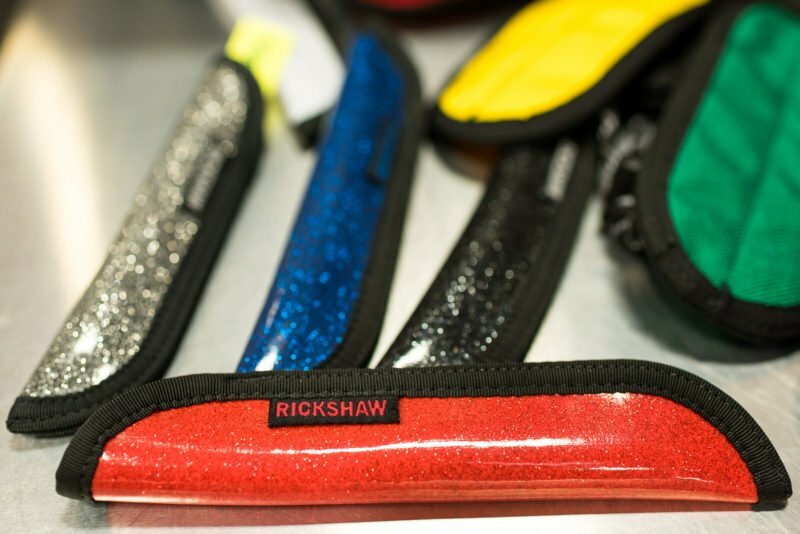 That’s why he started creating all of Rickshaw’s pen accessories. He told me that he can come up with a new design for a pen sleeve and have a sample in his hands the same day. How cool is that? Anyway, he was kind enough to let me take a few photos of the factory and products while I was there (you can find more at the bottom of this post). As you can see, it’s a pretty awesome place. 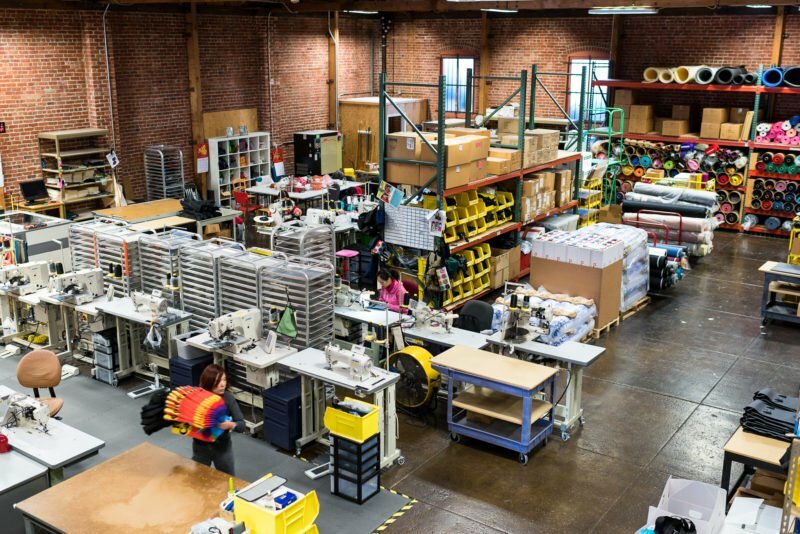 An overview of the factory floor. 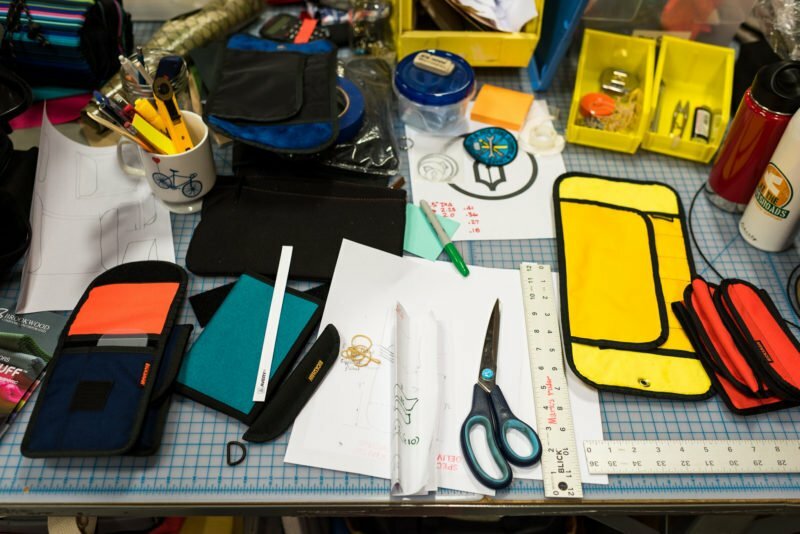 Mark’s creative space where new products are born! 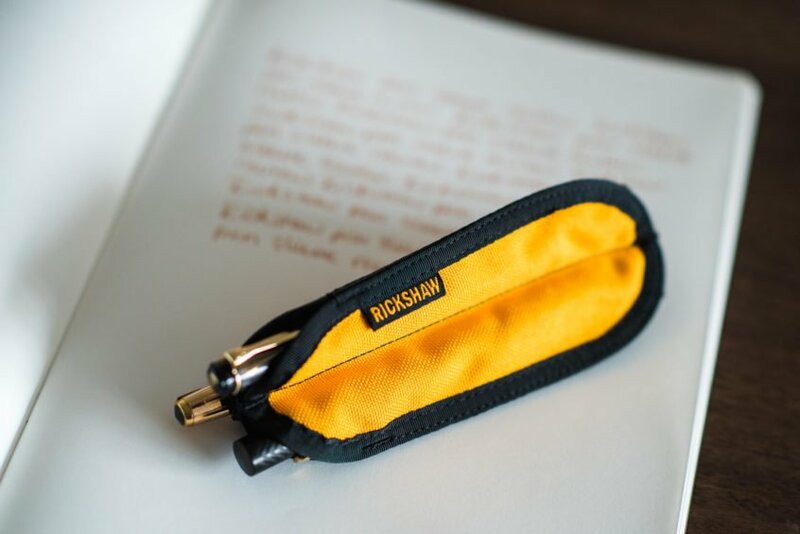 The Rickshaw pen sleeves and rolls come in a variety of sizes and configurations. There are options that hold 1, 2, 3, 4 or 6 pens and they come in up to six different lengths and diameters that fit a variety of pen sizes. Don’t even get me started on the color options. This screenshot should give you some idea of the different colors that are available (and that’s not even all of them). There are also different materials for the exterior of the sleeves. 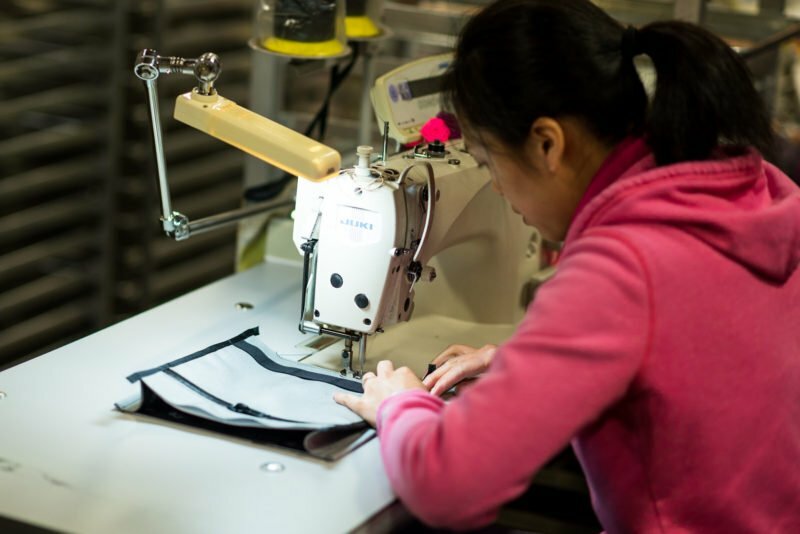 The most popular is Cordura Nylon, which is both durable and water-resistant and is also what you’ll find most high-quality backpacks are made of, but there is also a wonderful tweed option as well as some custom options available. 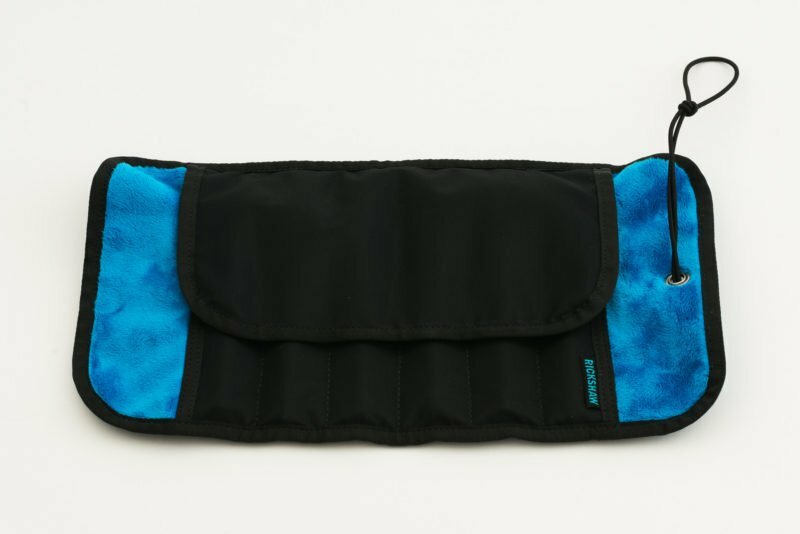 The lining of all of the Rickshaw pen sleeves and rolls is an amazingly soft plush fabric that is normally used in the toy industry (imagine those super-soft stuffed animals… that’s what the inside of these sleeves feels like), so it’s not going to shed little fibers all over your pens. 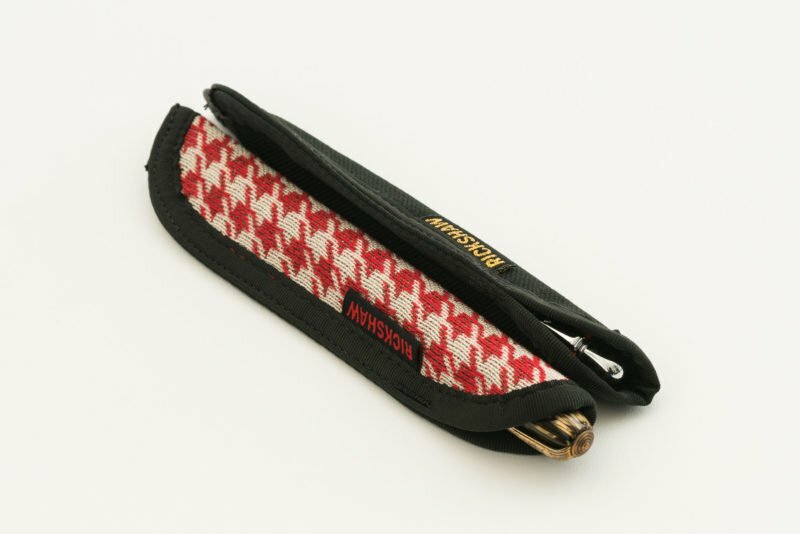 Not only does it protect your pens, but Rickshaw also color-coordinates the lining to the exterior fabric so the inside of your pen sleeve isn’t boring. Using the sleeves is as simple as sliding your pen inside. To remove your pen, you can grab the top and pull or squeeze the bottom of the sleeve to push your pen out the top. 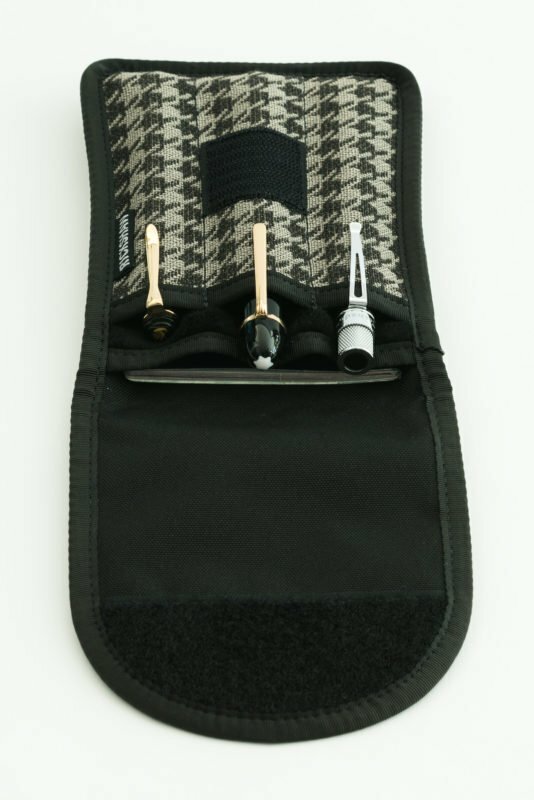 This works on all of the different configurations of pen sleeves (1,2,3 and 4 pen options). I did find that some capless rollerball pens with a tapered end (like the Retro 51 Tornado) were a little difficult to squeeze out of the sleeve since I couldn’t really get enough of a grip to push them out. Fortunately, this isn’t something you’re likely to encounter with any fountain pens. 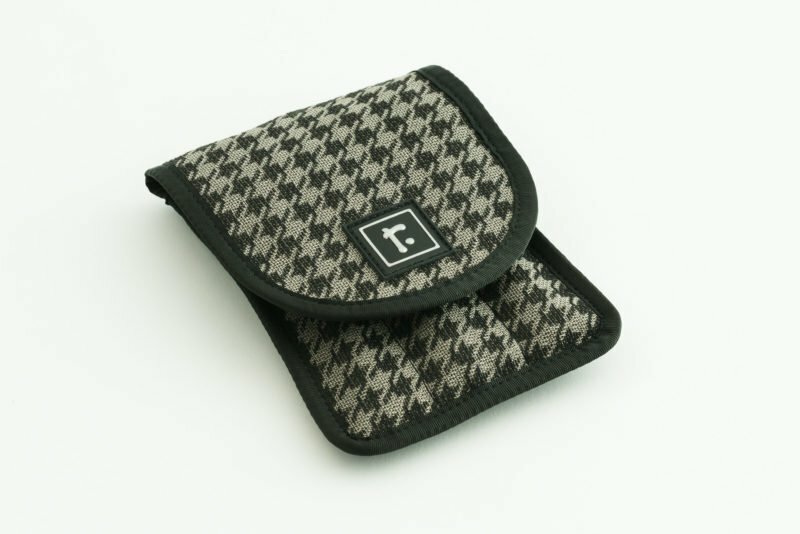 The Hemingway Deluxe Pen Roll is a little different from the pen sleeves. Your pens still stick out of the top of the pocket, but are covered by a flap to protect them. This means that they won’t touch each other when they’re rolled up. You can then roll it up and have a convenient, small roll of 6 pens that hardly takes up any space. 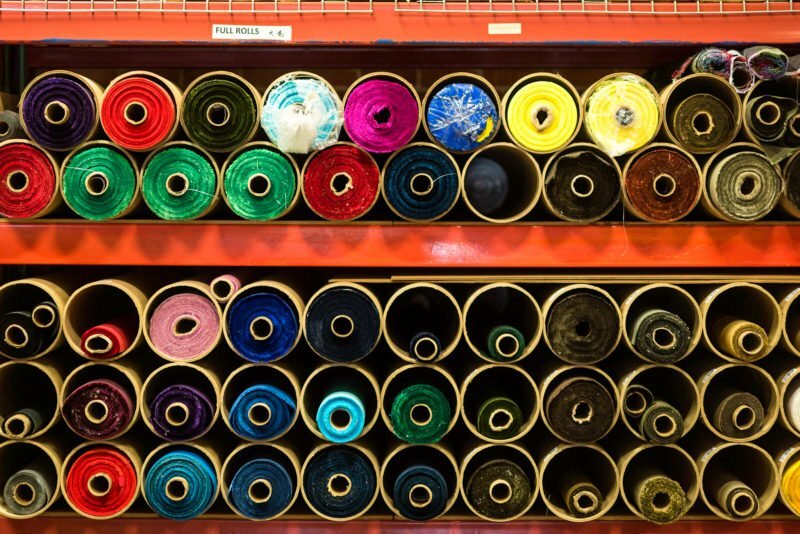 The roll is secured with an elastic cord that wraps around the roll and hooks onto itself. It can be tightened if need be. If you find it difficult to roll up the Hemingway, watch this video that Rickshaw put out that shows you how to do it. Unlike the sleeves, the roll does not come in different sizes. 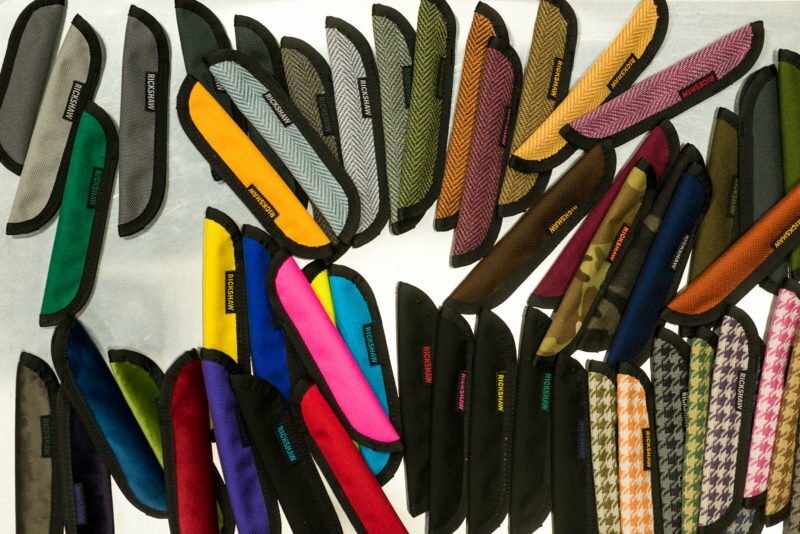 Each individual pocket is large enough to accommodate most pen sizes. I can imagine if you put an enormous, oversized pen into every pocket and rolled it up, it might be a little tight, but it should work perfectly for 99.9% of the pens you own. For example, my Montblanc 149 fit perfectly in the roll and if I had 5 more identical pens I don’t think I’d have any problem fitting all 6 into the roll. 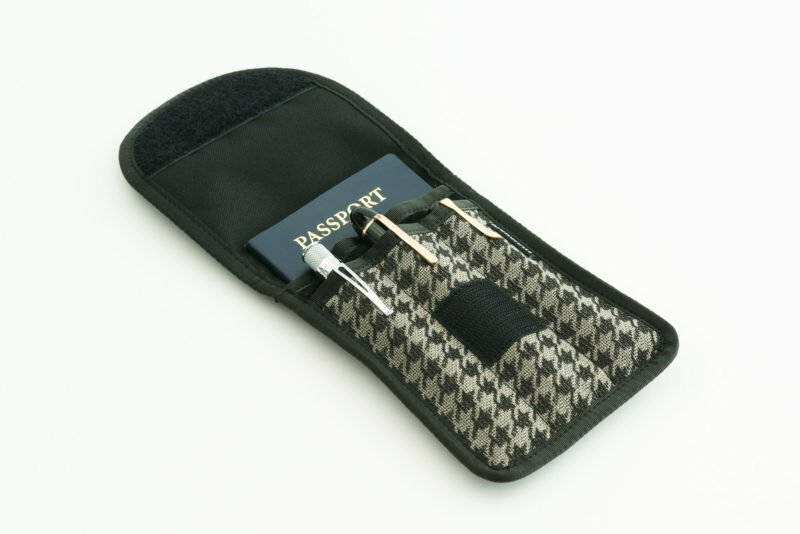 The WALDO Field Case is another great pen case that can hold up to 3 pens, but also has a pocket behind the pens that will fit a notepad, passport, cash, stickers or anything else small and flat. 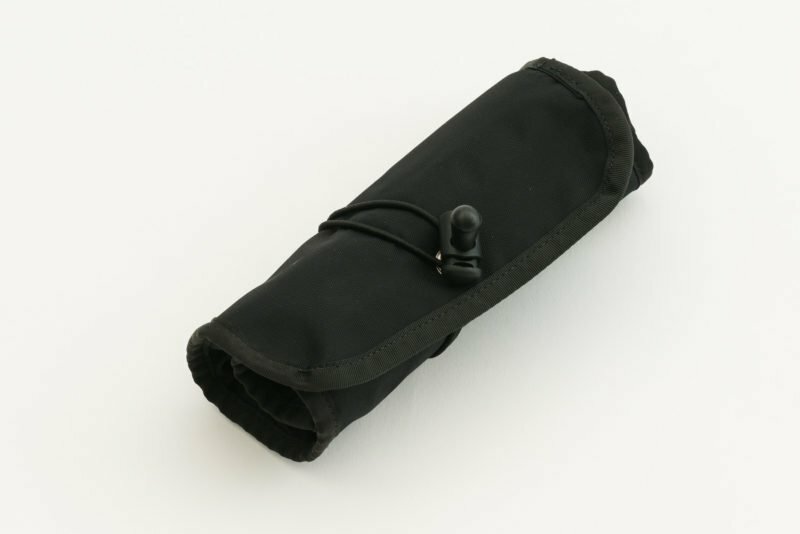 It comes with a plastic sleeve that you can place small items into, making it easier to pull out anything that might get lost inside the pocket. One complaint that I’ve seen others make (and Mark was quick to point it out) is the velcro closure on this case. 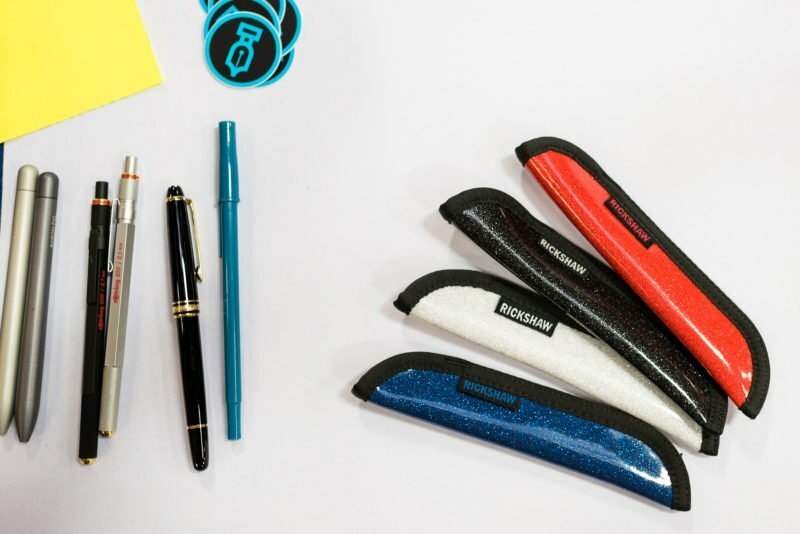 It does a great job of keeping the flap securely closed, but can be a little loud to open if you’re in a meeting and need to grab a pen. The reason for the velcro instead of a magnet or snap is that Mark didn’t want something hard and flat pressing against your pens, so velcro is really the lesser of two evils. My experience using all of the different sleeves, cases and rolls was the same. They are all great products. I never worried about taking my pens with me when I had them rolled up inside the pen roll. I just put it in my backpack and went about my business, knowing that when I unrolled it I would find my pens safe and sound. It was the same with the pen sleeves. I could put a pen in a pocket inside my backpack and not have to worry about it getting scratched up by whatever else happened to be in the pocket. 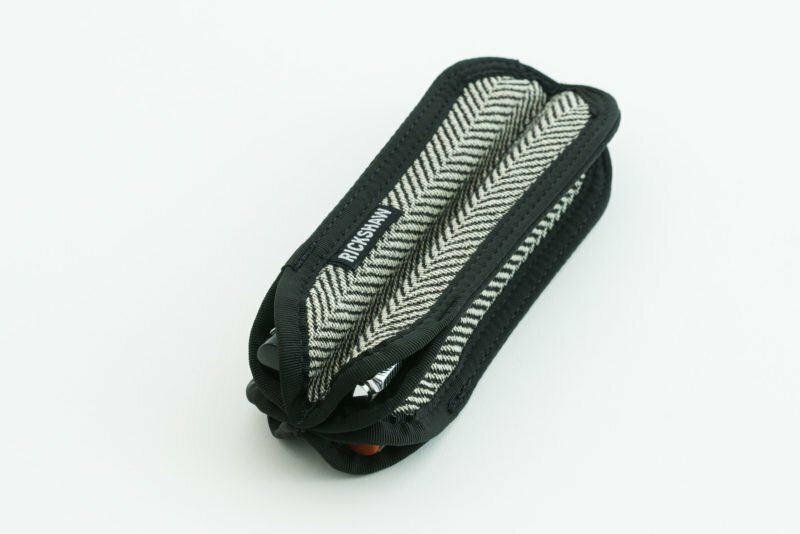 I had an experience with one of the pen sleeves that probably saved my bag and everything in it from an inky disaster. My wife and I went on a road trip and I brought along a variety of different pens. My Lamy Vista was inside of a single pen sleeve and apparently I didn’t correctly install the converter before leaving on our trip. When we arrived at our hotel and I pulled it out of the sleeve, I found my fingers and the pen were covered in ink! I stuck my finger inside of the pen sleeve and it came out covered in even more ink. Fortunately, not a drop of ink had found its way outside of the pen sleeve, keeping my bag and everything in it nice and clean. When I got home I rinsed the sleeve in cold water and let it air dry. Now it’s as good as new! Since the materials are synthetic, I didn’t even have to worry about mildew or a musty smell. I will say, it was a darker sleeve with an orange ink, so no visible staining occurred, but if it were a lighter sleeve material with a darker ink that might not be the case. These sleeves and rolls aren’t just made for when you want to take your pens with you when you leave the house. 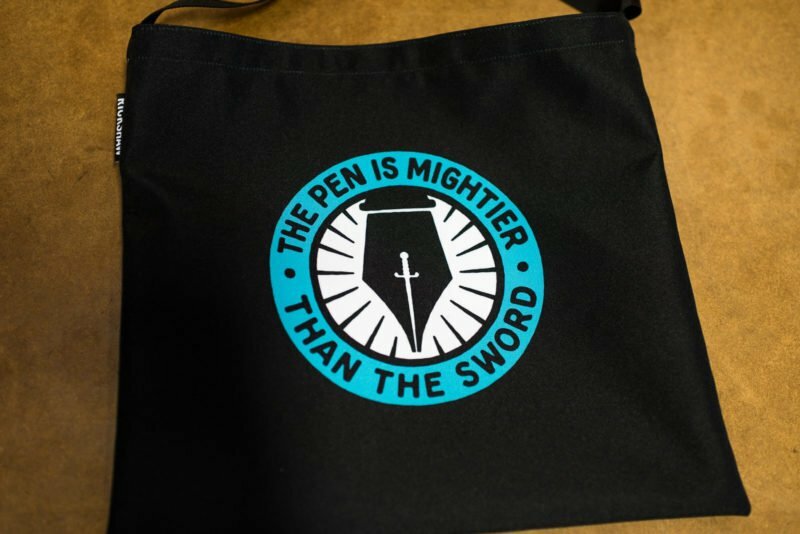 They’re also great for protecting your pens at home. As I’m typing this, I have a full Hemingway roll sitting next to me on the table. Not only does it keep my pens organized and within arms reach, it also protects them from any incidents that might knock an individual pen off of the table (a stray laptop power cord, loose sleeve, curious cat, etc…). The individual pen sleeves are great for the same reason. I have some vintage black hard rubber fountain pens that I never want to leave laying on the table for fear of fading, which means I rarely use them, but when they’re in a pen sleeve I can have them right next to me and they’re protected from the light until I need to use them. The Single and Duo pen sleeves keeping my pens safe, even just sitting on a table. 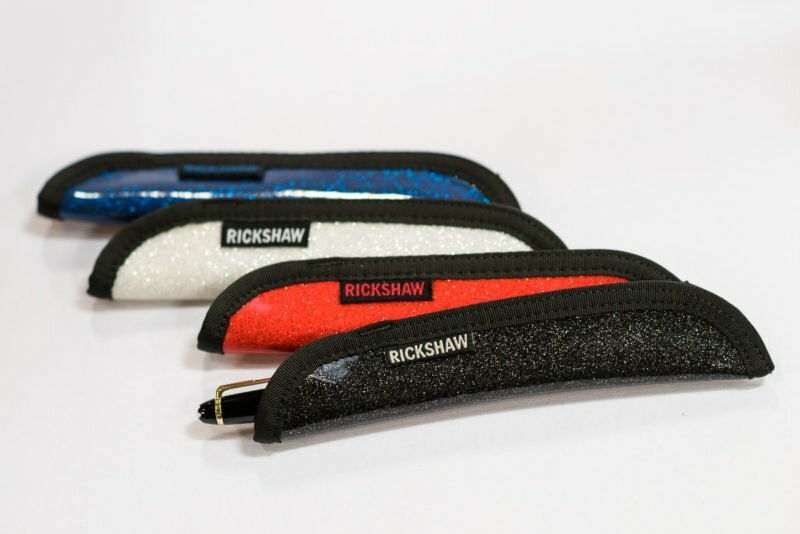 If you’re in the market for a pen sleeve or pen roll, you should definitely take a look at Rickshaw’s offerings. They come in a ridiculous variety of colors, configurations and sizes, so you should be able to find something that’s right for you. Their pricing is also competitive with many of the other options you can find on the market today. I’ve grown pretty attached to the different items that I reviewed and use them on a regular basis, so while it’s going to be a little painful to give them away, it will also make me happy knowing other people get to experience them. Plus, I know where I can pick up a few more. Keep an eye out for the giveaways in the near future. 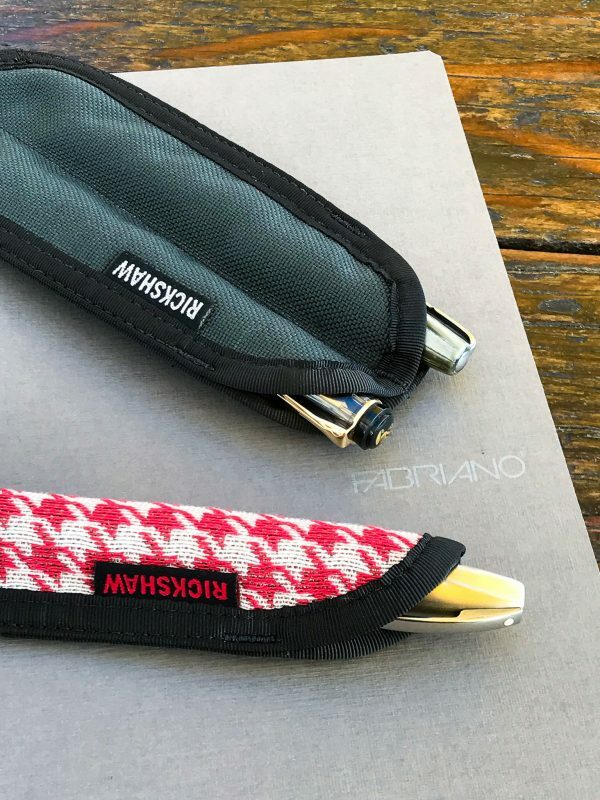 Head on over to Rickshaw Bags to view the full lineup of pen sleeves, cases, rolls and other accessories (including their original product… bags!). 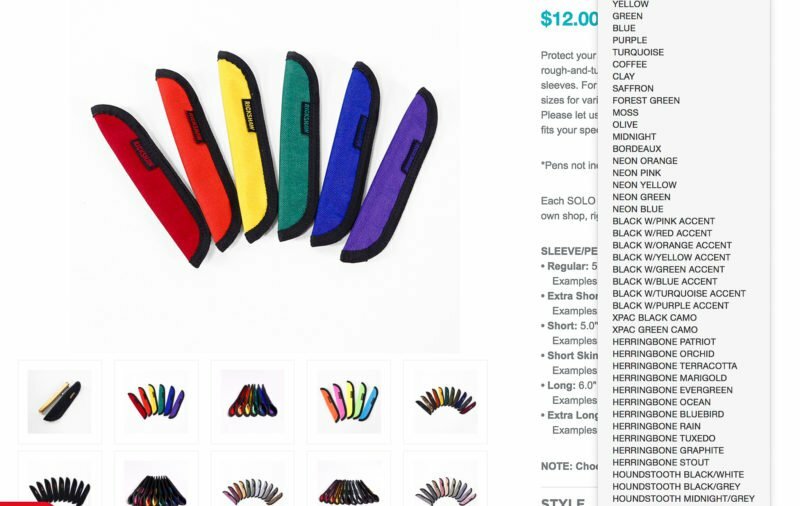 A selection of the various colors available for the pen sleeves. Miscellaneous pens and products at at Rickshaw HQ. Some sparkly vinyl pen sleeves they were trying out. Some of the Hemingway 6-pen rolls. 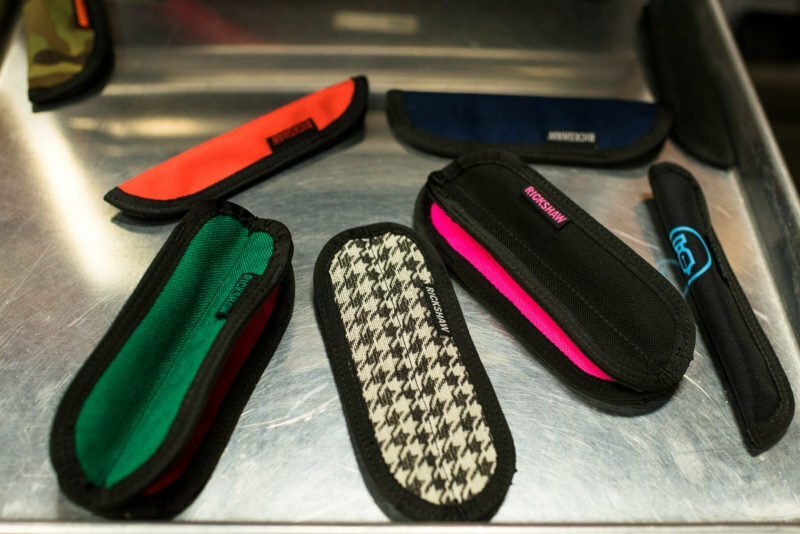 A few of the duo and clover pen sleeves. 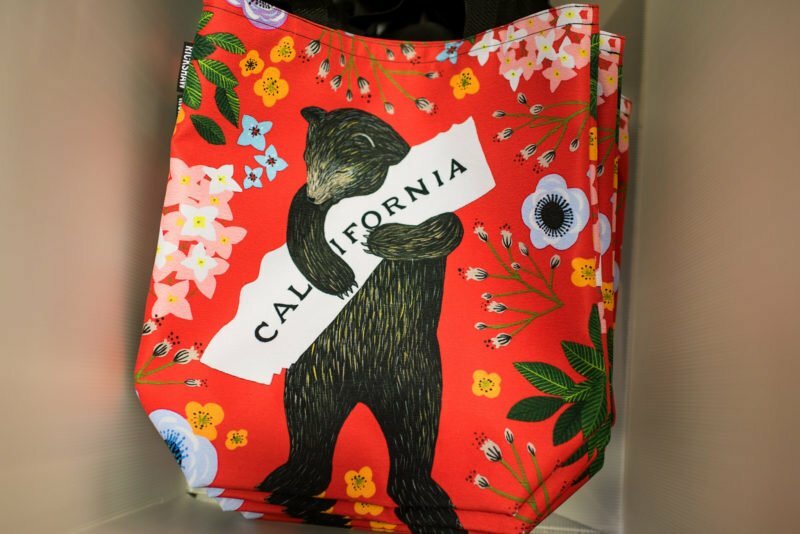 One of their non-pen bags with custom printed fabric. 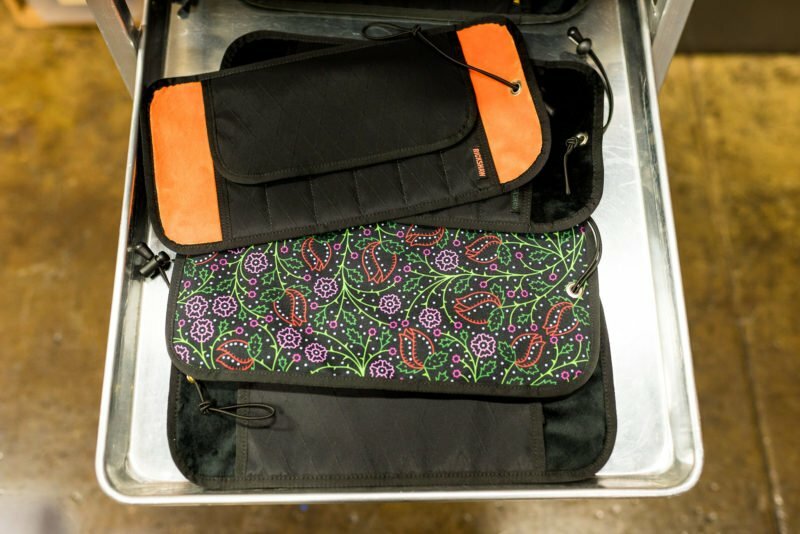 I’m fortunate to have several Waldo cases, one, two and four pen sleeves, a Hemingway roll and a custom roll sized for Baron Fig Squires all from Rickshaw Bagworks. Can’t say enough good things about the quality of the products and the service from the company.